'5 Questions with…' is a series I invented for this blog, late last year. I’ve wanted to do something like this for some time now and what better time to start that 2016. I’m always intrigued by the street style figures we see on Vogue.com or le21eme.com, or the ones whose articles we read online and in the pages of international magazines.. I want to interview these revered industry insiders with illustrious careers. Especially, I want to feature the ones that aren’t interviewed as often. To kickstart this series, I posed five questions to Sarah Harris. Sarah is the Fashion Features Director at British Vogue. You may be familiar with her articles if you’re a regular reader of the magazine. Her dissection of ’the return of show off fashion’ was featured in the September 2015 issue, a well-written look at the showy nature of the fall collections; or maybe you’ve read about her week as a Cavalli girl - a hit among reader, Sarah tells me. Her street-style is coveted by women globally, and street-style photographers clamour to photograph her. Equipped with impeccable style and an affinity for denim (95% of her time is spent in jeans, with over 90 pairs in her wardrobe); another underlying fact is her eye-catching grey hair. I hope you enjoy 5 Questions with… Sarah Harris. You’ve worked at Tatler, WWD and W, and currently you’re at Vogue. What were your roles at each publication? How does working at Vogue compare to the other publications? I’ve been lucky that I have always worked for great publications. I started at Conde Nast as an intern while at London College of Fashion and then worked for Tatler as soon as I graduated. Vogue is a great place to work, and it has changed a lot since I joined because now the job involves more than just putting a monthly magazine together, there is online, social media, the Vogue Festival, Fashion’s Night Out. It’s become a much bigger world. From trend reports to designer-specific pieces, what type of fashion feature does the reader respond best to? It always surprises me the stories that people remember. The ones I wrote that are most commented on are when I spent a week wearing couture, and also when I spent 5 days as a Cavalli girl, onboard the Cavalli boat in Cannes. First person pieces always tend to resonate with our readers. 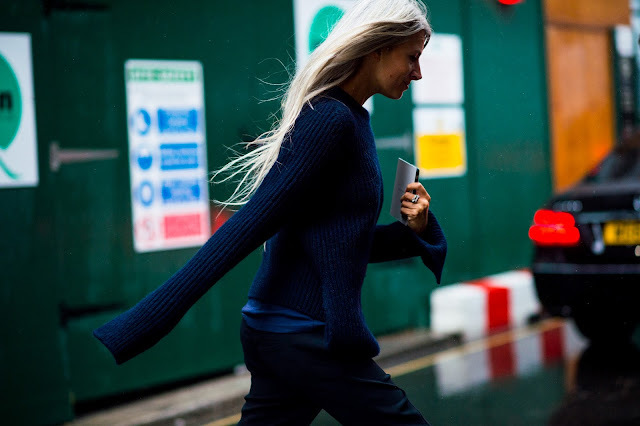 How do you feel about your street-style stardom? Well, it has become an odd part of the job! But I’m not under any illusions - I realise that people only take my picture because of where I work. Your hair is quite the talking point. Ironically, I’m going to ask you: do you ever get tired of people asking about it? It’s always lovely when someone complements it, and I’m always surprised when they do. I started going grey in my late teens and so it’s normal to me now, but lots of people find it quite unusual, I suppose because most grey-haired women dye their hair. The people who comment on my hair always ask me where I get it coloured, and i don’t think they fully believe me when I say it’s natural. It was another joy to see your post. It is such an important topic and ignored by so many, even professionals you can visit Nexter here for more fashion awareness!